Born in Fort Knox, Kentucky, Neil Bockoven has lived in Turkey and Germany, and in many states from California to Virginia. He attended The College of William and Mary. From there, Neil went on to The University of Texas at Austin where he earned a masters and doctorate. He has published articles on topics as diverse as the geology of huge volcanic calderas to sexual dimorphism in Astarte clams. He lives in Spring, Texas with his wife, Denise and their dog Spencer. Neil’s upcoming book Moctu and the Mammoth People, An Ice Age Story of Love, Life and Survival releases on July 15, 2019. The bad news is that Red Imported Fire Ants (RIFA or Solenopsis invicta) are here to stay. We’re not going to be able to get them out of the U.S. The good news is that it doesn’t take much time, effort, or money to control them sufficiently to keep yourself and loved ones safe. Two treatments costing about ten dollars each and covering a half acre is typically sufficient to keep them away for a year. About the only other good news is that their spread is slowing. Since arriving from Argentina in Mobile, Alabama in the late 1930’s, they’ve spread like wildfire to 20 states. But they don’t like freezing weather and elevations above ~500’, so they are having trouble surviving winters much farther north than a line running along the Tennessee-Kentucky border straight over to the southern border of Colorado. They’ve gone farther north along both the east and west coast, so their distribution forms a broad U-shape. They’ve wreaked havoc and destruction to the environment, and they cause billions of dollars of damage each year. Many ground dwelling species of insects, arthropods, reptiles, birds, rabbits, and even young deer have been killed, with some species going extinct. They are omnivorous, so besides killing wildlife, they eat germinating seeds and bore into fruits and vegetables, damaging crops. Considering just the soybean crop alone, they are estimated to cost over $150M each year in lowered yields. 14 million people are stung yearly in the U.S. and the number is growing as the ants spread. More than 80 people have died, typically from anaphylactic shock. Lately, one or two people die each year. If you or a loved one gets stung watch for signs of dangerous allergic reaction such as severe swelling and/or sweating, difficulty breathing, and tightness in the chest. If symptoms are seen, take an antihistamine and if symptoms worsen call 911. First let’s cover some of the many treatments that have been tried that DON’T work: grits, dry rice, mixing colonies together, gasoline, sonic blasts, aspartame, baking soda, cinnamon, coffee grounds, Malto meal, vinegar, and cayenne pepper – none of these work. 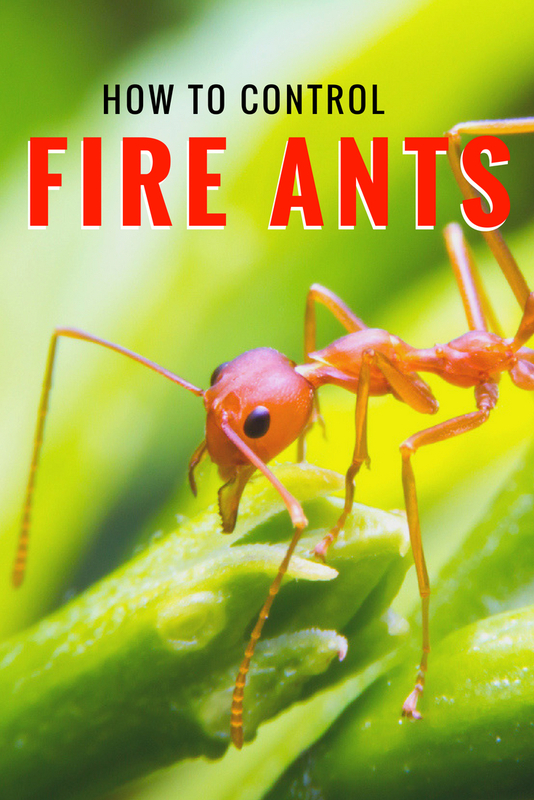 Industrial chemical control: Amazon carries more than 200 products for control of Fire ants, most of which work well. Hydramethylnon (Amdro) and Indoxocarb (Advion) baits are both effective and quick, usually killing a mound in 48 hours or less. Both can be broadcast, but treating mounds individually has less impact to the environment. Organic treatments that work: Pyrethrins (chrysanthemum extract), Terpenes (citrus extract), Spinosad baits (Fermented streptomycetes extract), Borax in sweet liquid, and Neem oil (from neem tree seeds). All of these can be found in products sold by your local garden shops or favorite online retailers, and all have some effectiveness, albeit not as great as the industrial chemicals above. Individual mounds can have as many as 500,000 ants. There are two social structures – monogynous and polygynous. Monogynous colonies have a single queen, whereas polygynous can have many queens (sometimes approaching 100). Many other ants bite and then spray formic acid on the wound. Fire ants bite and sting. They bite to gain traction, then inject a piperidine alkaloid from a stinger on their abdomen. Their stings are more painful than formic acid and cause more allergic reactions. Thank you for your info. I have had problem for some time and lastly used Amdro and it seems to help. I have tried several other products but they do not work well. I hope I can exterminate them. Gracias.